On North Bridge Road, stands Parkview Square, a grand towering monolith on an expanse of vivid green, with the doll-sized shop houses of Kampong Glam on one side and the squat grey blocks of Bugis Junction on the other. Aptly described by one critic as “art deco meets Gotham City”, it harnesses classical deco flourish to bold, powerful, futuristic lines. Designed by American Architect James Adams in partnership with DP Architects of Singapore, the $87.93 million edifice was inspired by New York’s 1929 Chanin Building. The streamlined exterior of Parkview Square is clad in brown granite, bronze lacquer and glass. It is heavily ornamented with motifs and sculptures. Gargoyles keep watch over its walls and four massive fibreglass men, holding light balls, stand guard on the points of its roof. The building sits in a Venetian-style piazza, ringed by statues of inspirational world leaders and artists, including Sun Yat Sen, Abraham Lincoln, Salavador Dali, Mozart, Chopin, Isaac Newton, Pablo Picasso, Rembrandt, Shakespeare, Plato, Dante, Winston Churchill and Albert Einstein. 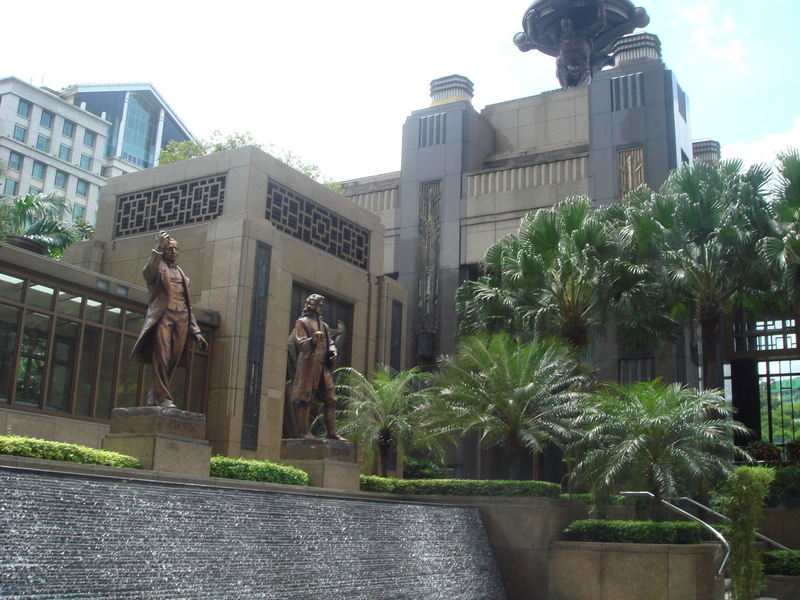 In the centre of Parkview Square’ Courtyard is a statue of a mythological golden crane, a talisman of prosperity for the building. A Chinese poem on the pedestal describes the bird’s return to its temple in Hubei. Inside, Parkview Square’s cavernous 15 metre high lobby has art deco pillars, balconies in cast bronze, walls with murals and ceilings with frescos in art nouveau style. But despite the stunning décor, centre stage in the lobby is seized by the Divine Wine Society Bar’s Gotham City-scale, 3 storey wine chiller. Primarily, Parkview Square is an office block, which seems me rather a pedestrian purpose for a building which speaks so volubly of boundless creativity and limitless skies. But then, who knows what inspired visions and bold dreams are born on those infinitely re-configurable floors? 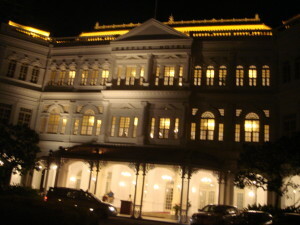 Raffles Hotel, named after the founding father of the city state, is one of Singapore’s most recognizable landmarks and arguably its most famous institution. The original Raffles Hotel, opened in 1887 by the Armenian entrepreneurs Martin, Tigran, Aviet and Arshak Sarkies, was a simple colonial bungalow with ten rooms. It stood on an auspicious site, however, beside the sea, at the corner of Beach and Bras Basah Roads, where, in 1842, Maria Dyer (wife of the Missionary Samual Dyer) had established Singapore’s first girls’ school. In 1899 the Sarkies’ modest bungalow was replaced by architect Regent Alfred John Bidwell’s grand colonial palace, which forms the core of today’s hotel complex. In time, a verandah, a ballroom, a bar and a billiards room were added, along with new wings and out-buildings. In 1989, Raffles closed for a $160 million dollar refurbishment. It re-opened on September 16, 1991, restored to the standard and style of its 1915 heyday. An extension, true to the building’s original colonial design, houses the Raffles Museum, the Jubilee Hall and the exclusive Raffles boutique shopping arcade, which includes Louis Vuitton, Tiffany’s and the local Bespoke Tailors CYC. Over the years, as the expanding city has reclaimed more and more land, the distance has grown between Raffles and the sea. Today, it stands 500 metres from the shore, in the heart of downtown Singapore. During the Great Depression, Raffles dropped into the doldrums and went into receivership. It was rescued in 1933, by the newly formed Raffles Hotel Ltd. When the conquering Japanese stormed Singapore on February, 15, 1942, they found Raffles’ guests dancing a last brave waltz. During the occupation the hotel was home to the Japanese army and was renamed Syonan Ryokan, Inn of the Light of the South. 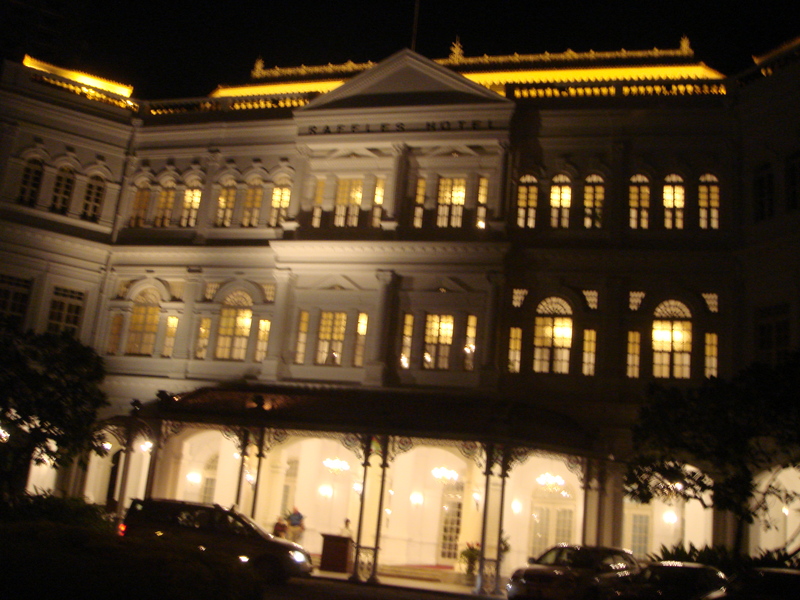 Raffles saw its darkest moments, when, after the liberation of Singapore, 300 Japanese soldiers detonated hand-grenades and ended their lives in its rooms. After the war, the hotel was used a transit camp where allied prisoners of war recovered from their ordeals. Raffles, too, recovered from the ravages of the war. On 16 September, 1991 it celebrated its 120th anniversary with Minister Mentor Lee Kuan Yew, who celebrated his 84th birthday on the same day. Today, Raffles is managed by Raffles International Limited and is one of the world’s great hotels. It is a national monument and a Singapore tourist icon. A Singapore Sling in Raffles Long Bar is de rigeur for any visitor to the island state. 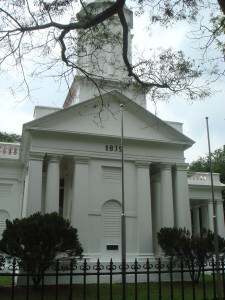 The Armenian Church of Saint Gregory the Illuminator on Hill Street is Singapore’s oldest Christian Church and one of its finest architectural landmarks. The Government donated the land for the church of St Gregory the Illuminator in 1833. 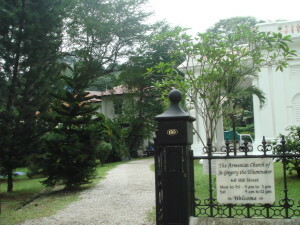 Half of the 5,000 Spanish dollars for the building was raised from within the Singapore’s small, but wealthy and influential, Armenian community. The rest was donated by Armenians in Java and India and by local Chinese and European merchants. The building was completed in 1835. In 1836 it was consecrated by Reverend Eleaza Ingergolie and dedicated to St Gregory the Illuminator, Patriarch of the Armenian Church. St Gregory’s is the masterpiece of architect George Dromgoole Coleman, overseer of Convicts and Superintendent of Public Works. It is built in the British Neo-Classical style and is modelled on the original St Gregory’s church in Echmiadzin in Northern Armenia. 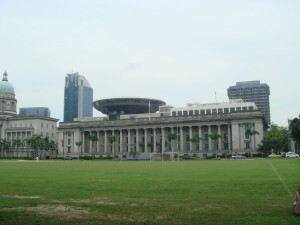 Although St Gregory’s incorporates influences from the classical architecture of Rome and Tuscany, with suggestions of some of the old British churches (London’s St Martin in the Fields and Cambridge’s Round Church), it is also uniquely Singapore. The wide porticos provide shelter from both sun and rain, the louvred windows allow ventilation and diffuse the sunlight and lastly the pews are backed with cool, light local rattan. The beautiful two storey parsonage in the church grounds was built by Nanajan Sarkies in memory of her husband. Beside it is the Memorial Garden to Singapore’s Armenians. Among those remembered here are Agnes Joachim, mother of the Singapore orchid and the Sarkies brothers who built Raffles Hotel. Sadly, St Gregory’s last Parish Priest died decades ago and was never replaced, the congregation has diminished and the Armenian orthodox services have ceased. The Armenian Church of St Gregory the Illuminator was gazetted as a national monument on July 6, 1973. One of the most string things about Singapore is its architecture. Colonial mansions, Gothic and Neo-classical churches, Georgian and Victorian public buildings, modern high rise towers, twenty-first century creations that, as yet, defy classification and, of course, its very own native sons, those exquisite shop houses, Singapore has them all. Among this panoply of great buildings, there are, however, some absolute stand-outs. 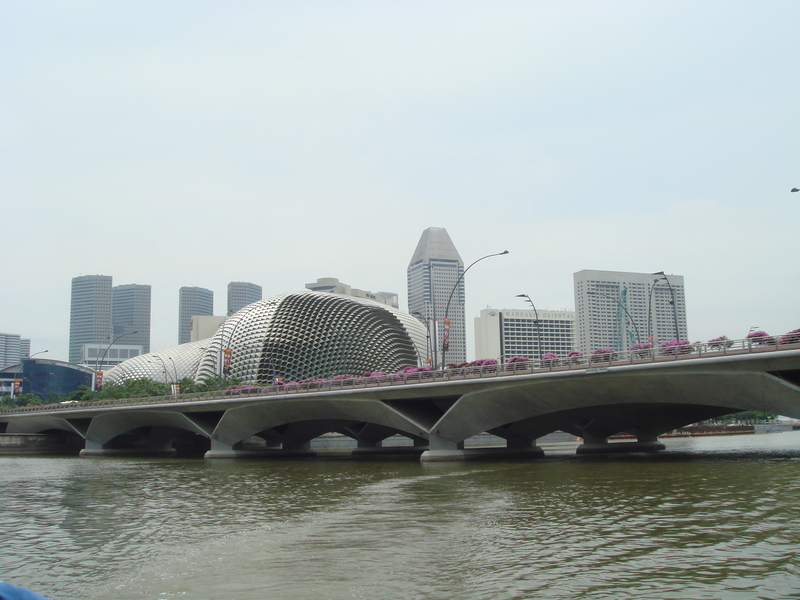 The Esplanade – Theatres on the Bay is, arguably, Singapore’s most eye-catching modern landmark and on its commanding Marina Bay site, at the mouth of the Singapore River, it can’t be missed from land or sea. Designed co-operatively by London-based Michael Wilford and Partners and DP Architects of Singapore, it consists of two great glass cones clad with thousands of little aluminum sunshades. Some liken the gleaming multi-faceted edifice to the eyes of a giant fly, others to a Durian. It was purpose built as Singapore’s centre for performing arts and under those enormous domes are; a 1,600 seat concert hall with state of the art acoustics, a 2000 seat theatre modeled on the classical opera houses of Europe, a public library devoted to the arts scene, an intimate 250 capacity recital studio, a small 220 seat theatre for experimental theatre and dance presentations, an exhibition space, Jendela, or window, in Malay, with a panorama on Marina Bay, two outdoor venues, the Waterfront Stage and the Stage @ Powerhouse, for free avant garde performances, a large rooftop garden terrace, leisure courtyards, open spaces and a mall with retail outlets and eateries. The 600 million dollar centre opened on 12 October 2002. On July 5, 2005, it seized the world stage when 117th session of the IOC opened here with concert showcasing Singapore’s multicultural heritage. Singapore’s Little India is a flourishing centre, alive with colour, noise and constant activity, where ancient traditions fit harmoniously into ultra-modern life, where diverse cultures blend and different religions sit comfortably side by side. It is unmistakably India but uniquely Singapore. In 1925, the British brought a contingent of Indian convicts to Singapore to work as construction labourers on the rapidly expanding settlement. For the duration of their sentences they were confined in coolie lines between Stamford and Bras Basah Roads. Once freed, they were given buffalos and land, in the city’s North West, and dispatched to begin new lives in their own India away from India. Thus, Singapore’s Little India was born. There are parts of Little India which are all India – bright, bold, extravagant and exotic. In the Arts Belt on Buffalo Road, the walkways are hung with Hindu emblems and paved with painted tiles of Indian design. Sensational souvenirs abound – statues, brassware, homewares, jewellery and silks, not to mention very special photos for those who wish to don a sari or a turban. There are demonstrations of traditional performing arts – Gamelan, Silat and Angklung. Across Serangoon Road, the Little India Arcade offers more; beautiful saris and sari fabric, stunning hand embroidered vests and slippers, shawls, trinkets, incense, ayurvedic herbs, wonderful authentic henna hand tattoos of ancient, mysterious design and the strange, mouth-numbing potions of the paan wallah or betel nut seller. Nearby Campbell Road is the home of age-old businesses; the medicine shop, traditional provisions stores and furniture stores with elaborately carved wooden wares. Here, too, are the Flower Garland shops, where men and women ply the oldest surviving traditional Indian trade, threading jothi, or garlands of marigolds, jasmine and roses, (symbols of peace, purity and love) as temple offerings or tributes to dignitaries. Further down Serangoon Road are the gold stores, selling dazzling and much-coveted yellow gold jewellery in a thousand and one elaborate designs. Deeper into Little India, in Cuff Road, is Singapore’s last traditional spice grinder, the only survivor from the days when spices were ground on the day they were used. Absolutely everywhere, in Little India, there are eateries; restaurants, diners, cafes, stalls and carts in every street and on every block, offering every imaginable dish and drink from every region of India. The air is alive with seductive smells, they permeate every corner, every nook and cranny; curries of every kind and strength, chapati, thosai, puri and naan breads with lassi of every flavour to wash them down and of course, teh tarik. Nowhere is timeless and traditional India more evident than in Little India’s houses of worship. The Angullia Mosque was built in 1898 on land donated by the wealthy Gujerati Angullia family, who are still its custodians. 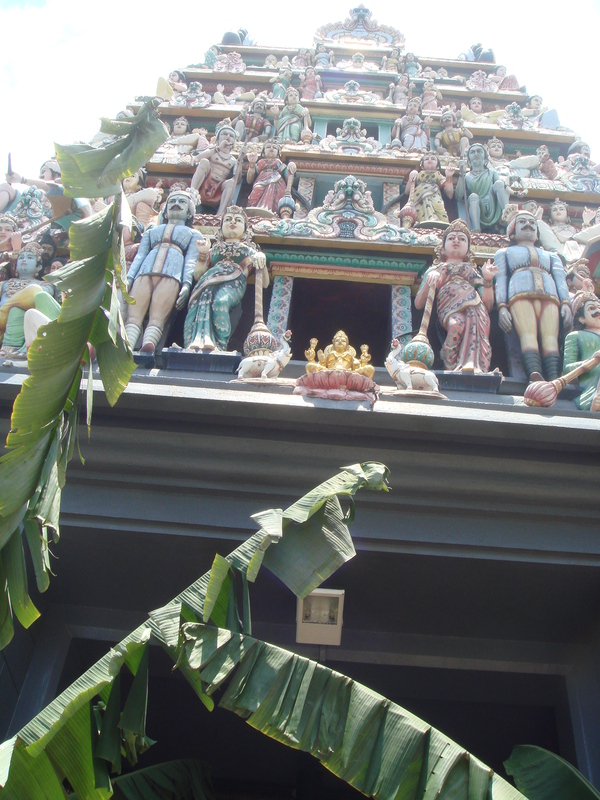 The Sri Vadapathira Kaliamman Temple in Petain Road is dedicated to Kaliamman, the protective mother-spirit. The Sri Srinivasa Temple in Serangoon Road which began life as a shrine in 1855 is dedicated to Lord Perumal, preserver of the Universe and God of mercy and goodness. The most famous and the oldest is the Sri Veeramakaliamman Temple. Built in 1855, it is dedicated to Kali, the many armed Goddess of power. 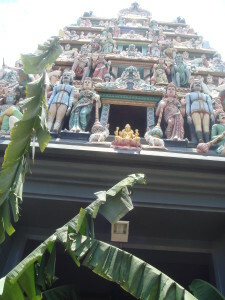 Fittingly, during Japanese bombing raids World War II, the people of Little India sought refuge beneath the richly adorned turrets of Sri Veeramakaliamman. Then, there are areas of little India which strongly reflect multi-cultural Singapore, like the houses of worship of other denominations which sit alongside its temples and mosques. The architecturally plain Anglican Church of True Light in Perak Road, built in 1952 for a congregation of Chinese tri-shaw operators now holds services in Tamil, Mandarin and English. 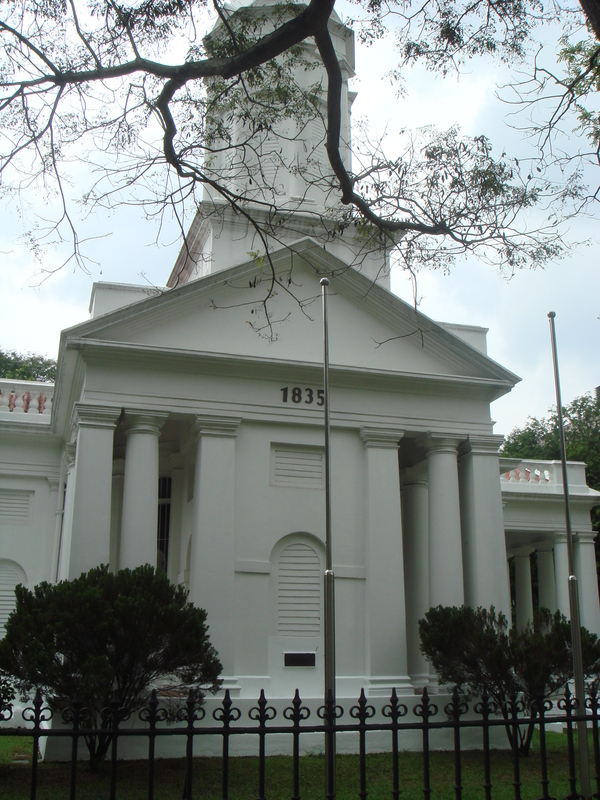 The Art Deco Kampong Kapor Methodist Church was built in 1929 to serve the local Peranakan Chinese Community. The Leong San Buddhist Temple, in Race Course Road is known as the Dragon Mountain Temple because of the sculpted clay dragons on its roof. The Sakya Muni Buddha Gaya Temple houses a 15 metre tall statue of Buddha surrounded by hundreds of lanterns. A blend of Moorish-Islamic and Southern Indian architecture, the Masjid Abdul Gafoor Mosque, completed in 1907, is famed for the spectacular sundial, decorated with 25 rays depicting the names of the 25 prophets, at its entrance. Singapore’s blend of cultures and styles is stamped on Little India’s secular architecture, especially on its beautiful old houses and shops. The House of Tan Ten Niah, on Kerbau Road, with its carved swing doors, or pintu paagar, is one of the area’s last surviving stately Chinese villas. Little India is rich in Singapore shop houses, from the early style in Dunlop Street to the transitional in Madras Street, to the blend of Peranakan-Chinese and Malay in Upper Dickson Road to the stunning Art Deco examples along Race Course Road, in the Arts Belt. There are glimpses in little India, too, of modern, cosmopolitan, commercial Singapore, in places like the gleaming multi-storey Mustafa Centre, in Alwi Road. Crammed with floor after floor of merchandise from around the globe it is packed 24/7 with shoppers from every corner of Singapore as well as tourists from all over the world. The Tekka Wet Market, edged by Buffalo Road, where once long ago, snake-charmers, astrologers, palm-readers and numerologists held sway, has long been a Singapore institution. Rebuilt now, with Housing and Development Board flats above, it is a shiny, clean, up-to-the- minute Singapore place. 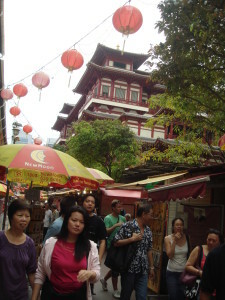 With its fresh vegetables and meat, the sumptuous fare at its hawker centre and the lively, colourful atmosphere it is always crowded with people – locals shopping for their daily provisions or grazing at the food stalls, tourists browsing and snapping pictures and hopefuls queuing to have their fortunes told by the one last Chinese Fortune Teller. The full splendour of Little India is revealed at Festival time; Thaipusam, in January or February when men process through the streets with decorated arches attached to their bodies with spikes; Navarathiri, where after nine nights and ten days of fasting, a chariot carrying a statue of the mother Goddess processes through the streets attended by song and dance; Deepavali, the Festival of light, marked by gaily coloured street ligh s and festive bazaars. At these times, ancient rituals and traditions are played out against the backdrop of the 21st century city and modern Singapore comes out to watch. Thanks to; Uniquely Singapore, Little India Walking Guide. Kampong Glam restaurants and cafes offer as much variety and interest as its shops. The North Bridge Road Muslim Indian establishments like New Victory, Mina and Islamic which have featured in the Good Food Guides of Singapore and Malaysia are famous for their roti prata, murtabak and nasi briyani. Further down, Warong Nasi Pariaman, with its brilliant ayam baker and beef redang, is a favourite with the Malaysian Royal family. Alaturka Turkish and Mediterranean Restaurant in Baghdad Street is distinguished by delicious apple tea but also does pretty mean kofte, kebab, and moussaka. Ambrosia, also in Baghdad Street, not only features an eclectic menu of Egyptian, Moroccan, Spanish, Italian and French fare, but has belly dancing with lessons for patrons who wish to join in. An absolute Kampong Glam, and indeed Singapore, gastronomic must, is Teh Tarik or pulled tea which is tea sweetened with condensed milk and poured back and forth in a long stream between pot and glass to make it thick, frothy and cool enough to drink..
Last but most certainly not least of Kampong Glam’s great attractions are its spas. In an Indonesian resort setting, the women only, Wayan Retreat Balinese Spa offers traditional treatments, including the Javanese Lulur scrub with spices and powdered rice and the Balinese Urut strengthening and renewing massage. The House of Traditional Javanese Massage welcomes both men and women. Its specialty is traditional Javanese treatments to soothe both body and soul. The best time to see Kampong Glam in all its cultural glory, is during one of the festivals; Hari Raya Puasa, or Aidilfitri, at the end of Ramadan (October) Hari Raya Haji or Aidiladha, at the time of the Haj (December) when everyone flocks to the Mosque in their best and most festive dress, for special prayers and rituals, when the streets are strung with lights, the Malay Heritage Centre is alive with sensational music, dances, plays and dioramas, the endless stalls of the Ramadan Food Bazaar line the street outside the Sultan Mosque and the Kampong Glam Street Bazaar is full of festive treats. 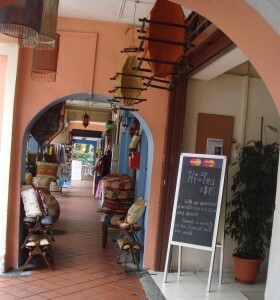 There is a great deal of the Middle East in Singapore’s Kampong Glam, especially in its shopping precinct. Like others all over the new world, Kampong Glam’s street names reflect the early settlers’ nostalgia for their homelands; there is a Muscat Street, a Baghdad Street, a Kandahar Street, a Bussorah Street, an Arab Street and a Bali Lane. Tiny Haji Lane recalls the pilgrims, who, for centuries, have stopped here on their way to Mecca for the Haj. Shop names, too, recall the old Arab world – names like Aladdin’s Cave, Baladi, Islamic and Café Le Caire. 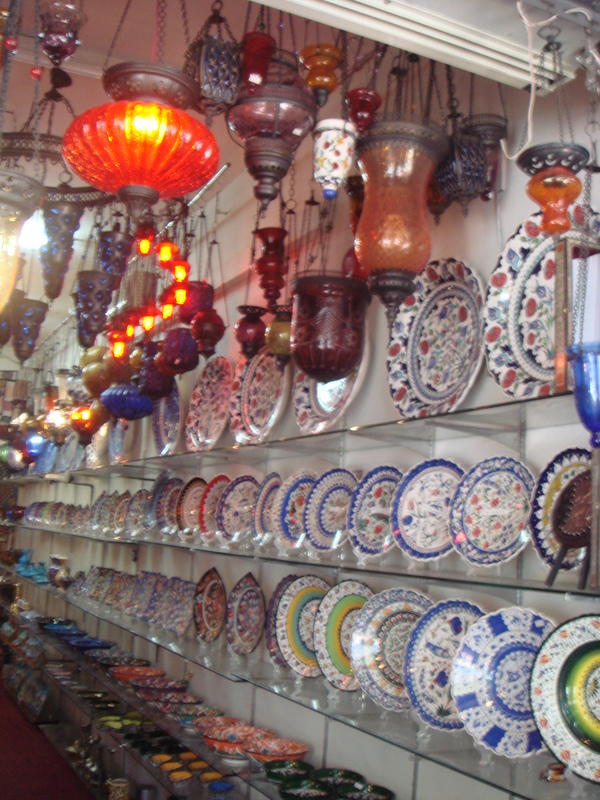 And in the long narrow verandahs, cluttered with colourful merchandise, which front the shops and border Kampong Glam’s narrow streets, there is something of the Arabian Souk. But above the shops and verandahs, the brightly painted facades of the shop houses, with their intricate blend of Malay, Chinese, Indian and Arab architectural designs, are uniquely Singapore. The original businesses of Kampong Glam served the needs of Muslim Singapore. Their clientele ranged from the Royal Court, to pilgrims on their way to and from the Haj to the humble village household. While the much of the clientele and many of the businesses have changed with the times, the traditional Muslim/ Malay/Middle-Eastern focus remains; today, Kampong Glam enjoys a reputation as one of Singapore’s most interesting and exotic shopping, dining and leisure spots. 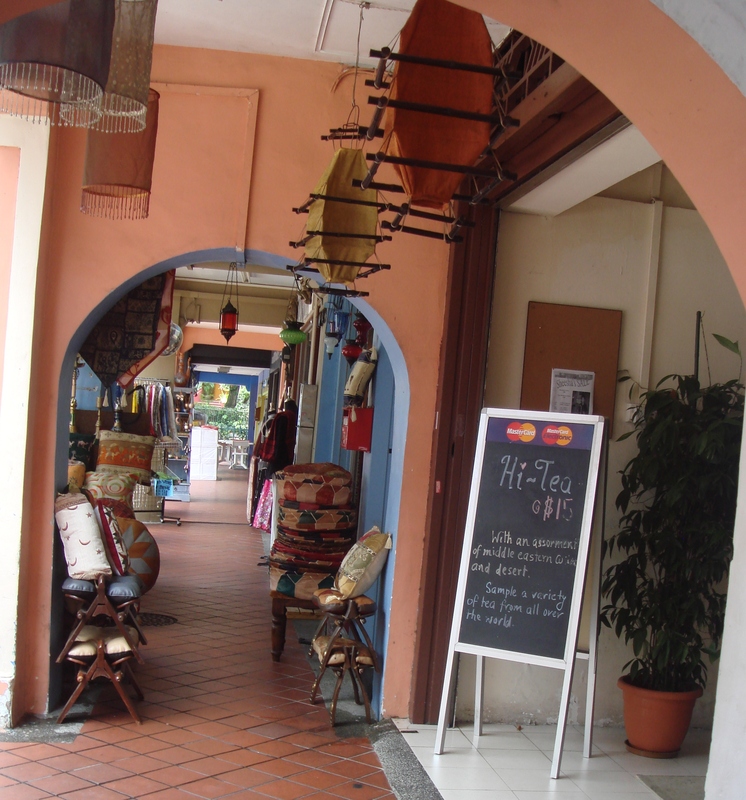 Some of the regions best treasures and collectibles are to be found in Kampong Glam. In the boutiques and stalls of Bussorah Mall and Baghdad Streets there are unique Malay and Indonesian home accessories; tableware, wall hangings, bed covers, lamps, bowls and baskets along with wooden, leather, cane, willow and brass handicrafts and antiques from all over the Malay Archipelago. In North Bridge Road perfume shops sell exquisite customised blends of essential oils from India, the Middle East, France and Switzerland in unique, hand-painted glass bottles from Egypt, Austria and the Czech Republic. In the oriental carpet galleries of Arab street there are giant pieces, straight from Arabian Nights, woven with elaborate patterns in magnificent colours; wall hangings fit for palaces; traditional prayer mats, with serene designs of ancient times and sinister Afghan rugs decorated with tanks, grenades and machine guns from the time of the Russians. Probably the most famous corner of Kampong Glam and known throughout the world as one of the last great textile centres, Arab Street is a Paradise for lovers of fine cloth. There is gallery after gallery filled with silks of every shade, weight and weave, stunning Indonesian and Malay Batiks, cottons from China and India as well as lace, embroidery, ribbon, sequins, crystals and beads. Arab Street clients range from the home seamstress to the haute couture houses of Europe and prices range from 15 to 4,000 Singapore dollars per metre. Alta Moda, at number 92 provides fabrics to Royalty around the South East Asia as well as to designers Valentino, Dior and Ungaro. Royal Fabrics, at 59, 65, 87 and 94 is now in the world textile spotlight, having won Tatler Magazine’s Best Company (Fabrics) Award in 2006. The salespeople of Arab Street know and love fabrics. They will cheerfully discuss weaves, textures, dyes or patterns for hours and will happily imagine with you and for you, that dazzling final creation. If, however, you’re not a closet couturier or skilled seamstress, there are tailors on hand in Kampong Glam to whip the fabric of your hearts desire into the dress of your dreams. There is also a wealth of wonderful shops selling ready-made creations, in fabulous fabrics, elegantly plain or beaded, braided, sequined and sparkling with crystals, to serve any taste or culture; traditional Muslim dress in the subdued hues of the Middle East and in the bright colours of Malaysia; Cheong Sams and tunics; exquisite embroidered Peranakan Nyonya Kebaya and sarongs; stunning traditional Malay wedding ensembles; handmade batik outfits in contemporary designs; modern western gear, both cheap throwaway and expensive designer and even belly dancing costumes. A thousand and one little places sell accessories to go with all this exotic apparel; scarves and shawls, jewellery and headgear, bags, shoes and beautiful beaded slippers. Buying or simply browsing Kampong Glam’s shops are a wonderful Singapore experience. 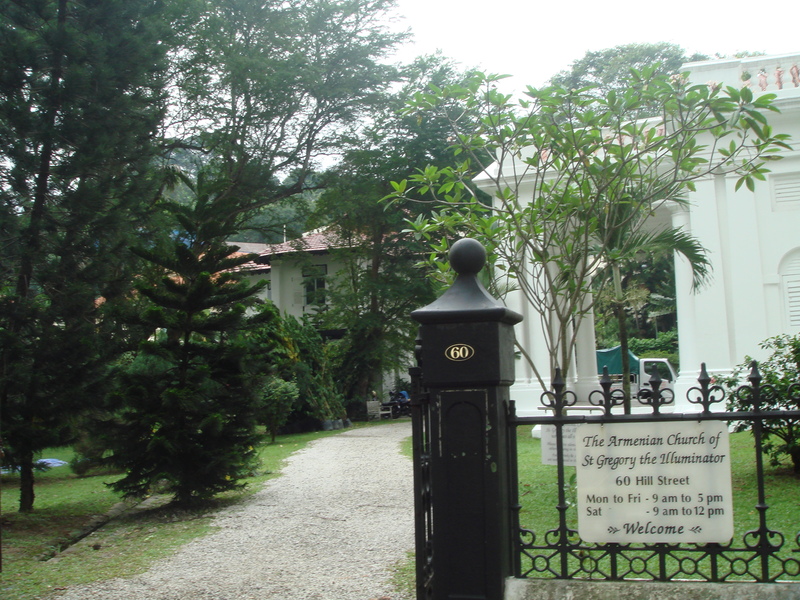 When Tengku Long signed the Treaty with Sir Stamford Raffles, in 1819, to found the British port in Singapore, there was already a long-established Malay settlement at Kampong Glam, then known as Kampong Gelam because of its groves of Gelam trees. It was here that Tengku Long, appointed Hussein, Sultan of Singapore after the Treaty, set up his royal court, complete with palace and mosque. It followed, then, that under Raffle’s 1822 town plan, Kampong Glam became the designated Malay-Muslim enclave. As immigrant workers, traders and tradesmen from Indonesia, Malaya, India and the Middle East settled and set up businesses there, the tiny village of only 150 souls quickly grew into a thriving centre of Muslim commerce, with the royal court as its centre and the Mosque as its heart. 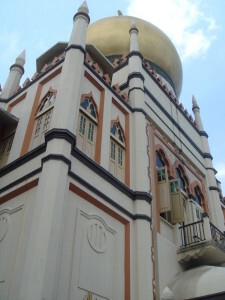 Still an enclave, bounded by busy Beach, North Bridge and Ophir Roads, in the city’s north-west, Kampong Glam is the hub of modern Malay-Islamic Singapore. The old royal court is still its centre of culture and tradition and the Mosque is still its heart and soul. Age-old trades and businesses continue in buildings little changed in a century and in streets that still smack of old village life and rich Muslim-Malay history. Today, Sultan Hussein’s royal court complex houses the Malay Heritage Centre. Set in lush green gardens at Sultan Gate, the elegant Istana, commissioned in the early 1840s by Sultan Ali Iskandar Shah, eldest son of Sultan Hussein, is now a heritage museum. Its eight themed galleries are lined with murals and filled with dioramas and artifacts showcasing Malay culture and outlining the contribution of the Malay community to building the new nation. Cultural Performances feature traditional dance, music and poetry while workshops include sarong tying, pottery, martial arts, dance and music. Next door to the Istana, the Gedung Kunung, or Yellow Mansion, once the home of the Sultan’s descendants, now houses the Tepak Sireh, a heritage restaurant which serves authentic Malay cuisine and is popular for traditional Malay weddings. Next door to the Malay Heritage Centre, backing onto North Bridge Road is the magnificent, Sultan Mosque. Built in 1928 to replace Sultan Hussein’s crumbling 1824 mosque, it was the result of a united effort on the part of the local Muslim community. Those who could made generous cash donations while the poor collected bottles which were used for decoration. The Sultan Mosque was designed by architect Dennis Santry and combines the Classical, Persian, Moorish and Turkish elements which make up the distinctive Malay Saracenic style. The massive prayer hall has 5,000 capacity and its end wall or Mihrab, which faces Mecca is intricately patterned in gold. The Sultan Mosque was designated a national monument in 1975. Its tall towers and gilded domes dominate every view from the Kampong and the call to prayer echoes compellingly through its streets.